Nano-coatings are being used regularly to protect printed circuit board assemblies. This is because the material they are made of fluorinated polymers and these materials have very specialized properties that produce very different results to traditional conformal coatings. So, what are the unique properties of a Nano-coating? Typically, the coating itself is comprised of fluorocarbons and characterised by carbon-fluorine bonds. Since the coating is made of fluorocarbons then the film surface is not susceptible to Van der Waals forces (interfacial electrostatic bonds). Therefore, the surface energy of the fluoropolymer coating is extremely low and hydrophobic (water repellent). It acts like Teflon on a frying pan. 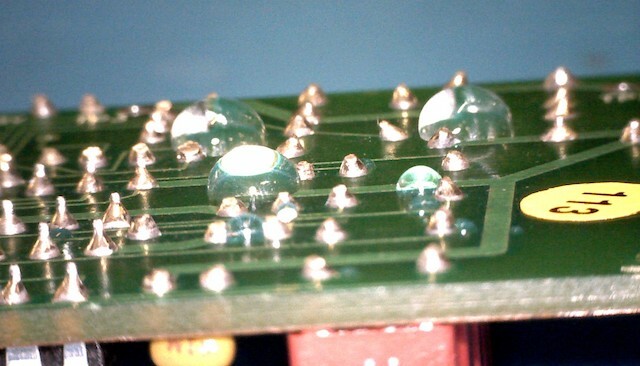 This non-wetting of water on the circuit board is one of the many key properties making them so popular. What other properties do Nano-coatings have that may help protect circuit boards? For electronic circuit board assemblies there are several key properties that are being used. • Chemically resistant: Having a high chemical resistance helps protect the circuits from chemical attack. However, to really understand the benefits you have to look at the key difference compared to a conventional conformal coating. That is that no masking is required when applying the Nano-coating. The key reason for using a Nano-coating in protecting electronics is that no masking is required whilst applying the coating to the printed circuit board. In the image above the connector is coated completely in the Nano-coating. It was just dipped in the coating. The image shows the water is being repelled from the connector. However, electrically the connector works perfectly fine. So, why is there no need to mask when using a Nano-coating? First, consider a normal conformal coating is applied at typical thicknesses of 25um or more. Also, the conformal coating is a high insulation material. Therefore, at this thickness the conformal coating would electrically insulate components like connectors and it must not be applied to any part that needs electrical conductivity. However, this is not a problem for a Nano-coating. Since the Nano-coating can be applied at ultra-thin thicknesses (1-2um in thickness or less) without any protection performance reduction, then the extremely soft coating is easily removed or scratched away when the connectors are joined and the electrical circuit is easily made. This key parameter of not requiring masking during Nano-coating application combined with the hydrophobic nature of the coating material makes the Nano-coatings highly effective in protecting electronic circuit boards at a very low cost per unit. Want to find out more about Nano-coatings? Or, read more on Nano-coatings on our website now. The Parylene conformal coating process is a very specialised vapour deposition application method using specialist vacuum chamber systems. This differs significantly to all of the other liquid conformal coatings available on the market that are applied by spraying, brushing and dipping. Parylene coating is completely conformal and uniform to the surface of the Printed Circuit Board (PCB) or product. It is also pinhole free. Therefore, components with sharp edges, points, flat surfaces, crevices or exposed internal surfaces are coated uniformly without voids. Parylene coating provides an excellent moisture and gas barrier due its very low permeability. 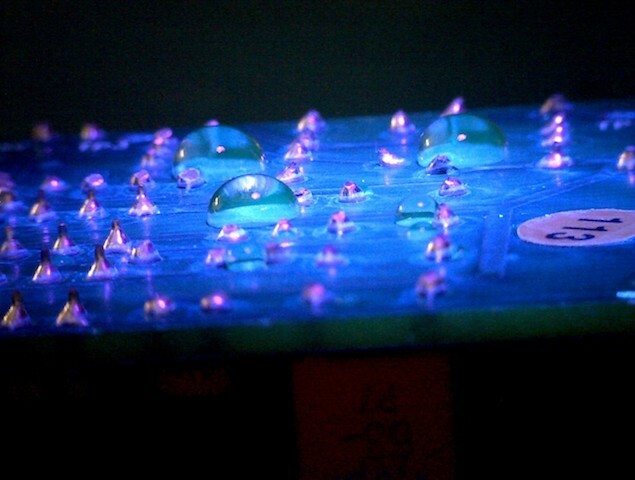 This means that electronics circuit boards coated in Parylene generally are more “waterproof” than the same electronics coated in a liquid conformal coating. Parylene is unaffected by solvents (it has very high chemical resistance) and is very effective against salt attack. Parylene has excellent electrical properties. This includes having low dielectric constant and loss with good high-frequency properties, good dielectric strength, and high bulk and surface resistance. Or, read more on Parylene equipment and our Parylene subcontract services now. A Nano-coating is hydrophobic. It repels water from the surface of the circuit board and water will not wet the circuit. The Nano-coatings are extremely thin (<2um). They are very different to traditional conformal coatings. Find out how we can help you with your Nano-coatings now. Contact us to discuss your needs and let us explain how we can optimize your process for you. Molecular Vapour Deposition (MVD) is a new process introduced to the electronics coating market. 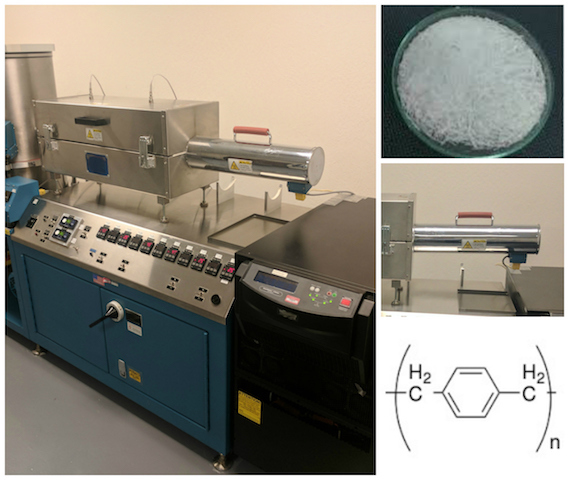 MVD is a hybrid coating technique using ALD (Atomic Layer Deposition) and CVD (Chemical Vapor Deposition) coating processes in combination. The method uses multiple layers of ultra-thin coatings with differing properties to build a completely protective coating with a final hydrophobic Nano coating as a top layer. Find out how we can help you with your Molecular Vapor Deposition (MVD) now. Nexus, the independent conformal coating resource, recently published an article on subcontracting your conformal coating services out to a third party. I thought it would be useful to signpost people to this article and republish the points they raised since getting it right can be so critical in outsourcing. Nexus identified that there are, “three key points to consider when choosing a subcontractor”. Find out how we can help you with your conformal coating process now. A fluoropolymer Nano-coating is an ultra-thin film comprised of fluorocarbons and characterised by carbon-fluorine bonds. Chemically inert, fluorocarbons are not susceptible to Van der Waals force. This means that films formed using these materials are non-stick (hydrophobic and water repellent) and friction reducing. Also, due to the fluorine bonds, these Nano-coatings demonstrate a high level of chemical resistance to acids, bases and most solvents. This makes them interesting materials for protecting electronic circuits. Click here to read more about Fluoropolymer nano-coatings. UL are the Underwriters Laboratories and are a global safety certification body for consumer electronics. They are a 3rd Party test service. There is no self-certification available. A qualification to UL can be used as a sign of quality control and testing independently of the coatings protective ability. When do you need UL? Sometimes it may be required that the conformal coating needs UL approval to be applied to a circuit board. It will depend on the market the electronics goes into. 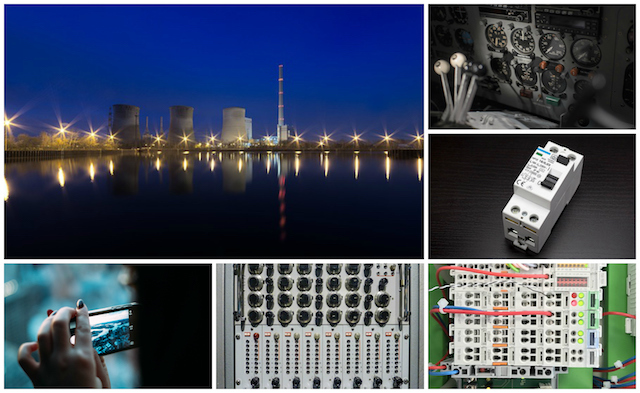 UL approved coatings can be used on electronics in many diverse sectors such as the domestic home, industrial controls, telecommunications and aerospace. In fact, in nearly all areas conformal coatings tend to be used for protection. UL approved coatings can be requested in nearly all areas conformal coatings tend to be used for protection for electronics including domestic home, industrial controls, telecommunications and aerospace. Contact us to discuss your needs and let us explain how we can optimise your process for you.